Very Good. Box is 4 x 3", purple, yellow and white, light wear and soiling, cards are very good to fine. 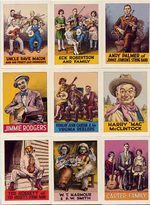 A set of 40 cards featuring the Carter Family, Burnett & Rutherford, Red Patterson's Piedmont Log Rollers, Happy Hayseeds. New. 0971008051 Please allow 4-14 business days for Standard shipping, within the US. Thank you for supporting our small, family-owned business! Fine. 0971008051 Please allow 4-14 business days for Standard shipping, within the US. Thank you for supporting our small, family-owned business! Fair. 0971008051 Please allow 4-14 business days for Standard shipping, within the US. Thank you for supporting our small, family-owned business! Wonderful set of 40 cards by Robert Crumb depicting 40 great pioneers of country music. This is the 1992 revised edition. Fine in a fine box.